December 30, 2016 by Teresa G.
Let the stars shine with this eclectic antique silver mirror. Cylindrical metal rays form a mosaic frame with variations in shading and distressing. 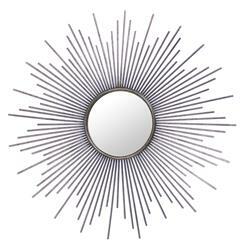 The generous scale of the sunburst mirror will twinkle in an entryway, shine in a sitting room and beautify a bedroom.